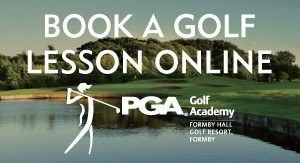 The PGA Golf Academy at Formby Hall Golf Resort boasts an impressive golf instruction school which has been created to help both beginners through to established club players and elite competitors to develop their skills and improve their golf. Alongside the impressive practice facilities, our dedicated team of PGA qualified AA professionals utilise the latest cutting edge analysis technology to ensure that golfers of every level have the opportunity to understand and improve each aspect of their game. One on one golf lessons are structured to allow you to focus on your individual requirements. Our PGA approved instructors will assess your strengths and weaknesses before prescribing the correct program to help you achieve your goals. Whether you are making your first few steps or looking to develop your game, our coaching team have the experience to help you feel at ease in an environment that lends itself to learning new skills. Furthermore we offer a variety of golf lessons that are designed to fit around you and your schedule, so you can learn to play golf at a time that suits you. Call the Golf Shop & Academy Team on 01704 875 699 or click here to send us an e-mail for more information or to book. Formby Hall is home to brand new Mizuno Approved Fitting Centre which was officially opened by Chris Wood, 2016 BMW PGA Champion, in May 2017. Situated in our PGA Golf Academy the fitting studio boasts Mizuno’s Shaft Optimiser and Swing DNA fitting system allowing us to identify the best matched iron model and unique custom set up specification to help you get the best out of your swing. The Mizuno Shaft Optimizer and Swing DNA system has been the industry’s leading fitting system at local golf club level since its introduction in 2009. In just 10 minutes Mizuno’s Swing DNA system can shortlist the best matched 3 irons shafts from over 40 options. With another 20 minutes, you can test the performance and identify the set make up best suited to your unique Mizuno Swing DNA. In just 5-7 days (parts allowing) later your unique iron set will be ready for dispatch from Mizuno’s assembly line in Scotland. For any enquiries or to book please call the Golf Shop on 01704 875699 or click here to enquire. Did you know that Formby Hall is home to the first PGA National Residential Golf Academy in the UK? We were awarded this status back in 2008 based on our accommodation and superb coaching and practice facilities. That we have created a fun coaching environment that lends itself to learning new skills. Our Residential Tuition packages are available from 2 through to 5 day trips and also allow you to relax and unwind by taking advantage of our stunning hotel facilities including swimming pool and Leisure club, Spa and The Fairway Bar & Grill. Our dedicated team of PGA qualified professionals have designed the itineraries to ensure that every aspect of the game is covered, from maximising your distance from the tee and striking crisp iron shots, to distance control techniques and rolling your putts more consistently. Residential Tuition golf breaks are available for all, whether you are new to the game or an established golfer. The fantastic state of the art facilities at the PGA Golf Academy allow us to offer a wide range of services, all aimed at giving you a memorable coaching break and taking your golf game to the next level. *Prices are per person based on two people sharing a twin or double room. If you have specific requirements or would like to discuss alternative dates or enquire about availability on our forthcoming dates then our Golf Academy staff will be more than happy to hear from you. Get your golf game off to the best possible start with our Give Golf a Go group classes. Our experienced PGA Instructors teach you the fundamentals and help you build a consistent, technically sound golf swing. You will discover what each club is designed to do, how to hold the club and stand to the ball as well as how to develop a golf swing built around sound fundamentals. We run 12 classes on a monthly basis and they are one hour in duration with group sizes typically between four and eight people. No need to bring your own equipment, we will supply clubs and with the Academy being under cover, we never get rained off! Don’t forget you can use our practice facilities including driving range, short game area and PAR3 course any time you like. If you don’t have any clubs don’t worry, we’ll let you use ours. 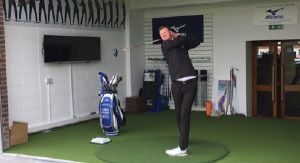 Our full time PGA qualified instructors blend years of experience of studying thousands of swings, researching different teaching styles and attending PGA advanced coaching seminars to help deliver first class instruction. At Formby Hall we recognise that if you invest time and money in your game then you need to play your best to fully enjoy your golf. This however can be restricted if your equipment doesn’t match your technique. We stock a selection of test clubs from club manufactures which can be tested at any time on our driving range. Our Golf shop staff will advise you on the length, lie and design of the clubs which will then allow you to try the clubs in your own time against your current clubs. Trained by leading club manufacturers, our expert fitting professionals will guide you through the fitting process and provide you with a recommendation on a set of clubs designed to suit your build and technique. Using our Trackman radar we take over 20 measurements per shot including swing and club speeds, smash factor, spin rates, launch & land angles, ball dispersion and distances. This data allows us to accurately identify the correct club head and shaft combination to help you play your best no matter what level of ability or experience you have giving you the confidence that your clubs are tailored for you. What is the cost for a Pro-Fit? Because of the time required by our professionally trained staff to provide this service and the equipment required to produce the detail and accuracy in the fitting process the cost is £50 for iron or wood fittings each. When you consider how often and the clubs are to be used and the importance to your game we believe that this represents good value. Will you get the fitting fee back if I buy the clubs? No you don’t but we appreciate your visit and as a thank you we will offer you a voucher to redeem separately against range balls or a range card. As we regularly check our prices against our competitors and the internet we also guarantee that we can provide you with a very competitive quote for your new clubs. One of the leading practice facilities in the North West, the driving range has 20 individual floodlit and weatherproof bays, 2 teaching bays, 2 private swing analysis rooms and Mizuno Approved Fitting Centre. The Driving Range is equipped with white Srixon Range Balls and the outfield features high visibility distance markers sponsored by Mizuno. The range is open to non-members 7 days a week. The driving range is fully installed with Power tee automated teeing systems. Golfers can practice hitting irons and fairway woods from two different surfaces with up to 4 different tee height options allowing you to select your ideal tee height. Have you heard of our NEW Golf Academy Loyalty Memberships? Our superb practice facilities include floodlit, covered driving range, putting green and short game chipping area. These training facilities have been designed to provide our members with the best opportunity of getting the most out of their game. Become a member and save £500 on your practice time. The PGA Golf Academy has a dedicated chipping area including 3 target greens and 3 bunkers. Available at £8 to non-members to work on their short game skills. Maximum 3 players at a time. Harold Swash Putting has more than 40 years’ of experience in the golf industry through coaching, golf club design and the creation of putting training aids. As a result of it’s passion for coaching, Director of Instruction Phillip Kenyon, brings to the golfing public the Putting School of Excellence, offering golfers of all abilities the chance to conquer the ‘Game within a Game’. Phil and Harold between them have coached some of the world’s leading players such as Padraig Harrington, David Howell, Henrik Stenson, Darren Clarke, Oliver Wilson, Oliver Fisher Nick Faldo and Ian Woosnam, amongst many others.